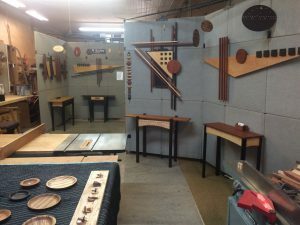 Open house in my studio during RAGBRAI, 2018. Off to Highland Park (Chicago) for the Port Clinton show Aug 25-26. Custom orders welcome. Current inventory available upon request. Wood choices are flexible to suit your preferences. Dimensions and designs are also flexible to suit your space and needs.